This IMA Volume in Mathematics and its Applications TOWARDS HIGHER CATEGORIES contains expository and research papers based on a highly successful IMA Summer Program on n-Categories: Foundations and Applications. We are grateful to all the participants for making this occasion a very productive and stimulating one. We would like to thank John C. Baez (Department of Mathematics, University of California Riverside) and J. Peter May (Department of Ma- ematics, University of Chicago) for their superb role as summer program organizers and editors of this volume. We take this opportunity to thank the National Science Foundation for its support of the IMA. Series Editors Fadil Santosa, Director of the IMA Markus Keel, Deputy Director of the IMA v PREFACE DEDICATED TO MAX KELLY, JUNE 5 1930 TO JANUARY 26 2007. This is not a proceedings of the 2004 conference "n-Categories: Fo- dations and Applications" that we organized and ran at the IMA during the two weeks June 7-18, 2004! We thank all the participants for helping make that a vibrant and inspiring occasion. We also thank the IMA sta? for a magni?cent job. 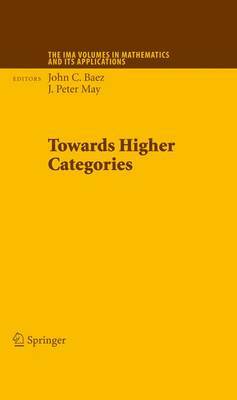 There has been a great deal of work in higher c- egory theory since then, but we still feel that it is not yet time to o?er a volume devoted to the main topic of the conference.